"Let the fly-in season begin!" For Susie and me. there is something special about the first fly-in of the year, Sun "n Fua held in Lakeland. FL. Maybe it has something to do w ith the manageable size of this larger fly-in. Maybe it is their emphasis on homebuilt airplanes. Or maybe it is the close proximity to the other fun Florida attractions found in Orlando. Tampa and Cape Canaveral. Heck. Who am I trying to kid here? We drove over 1100 miles from northeastern Ohio for the sunny Florida weather! Ohio had one of the colder and snowier winters on record this year and we had full-blown cases of cabin fever to prove it. All kidding aside, we really enjoyed catching up with all our aviation buds, checking out some planes and eating roasted corn! There were some changes this year at Sun 'n Fun. Time will tell if they were good changes. There were also many notable. interest-grabbing sights on the grounds. I will try to describe a few. - One huge change this year related to the opening day of the week long event. In prior years, the show started on Sunday and ended on Saturday. This year the event began on Wednesday through Tuesday. When we asked a gentleman at the registration booth why they had altered opening day he said. " In the past, people complained that they could only come on the weekend and by the time Saturday arrived. many of the planes were gone and there wasn't much left to see." Our informal poll showed that there did seem to be more people on Saturday and many of them appeared to be locals checking out the event. 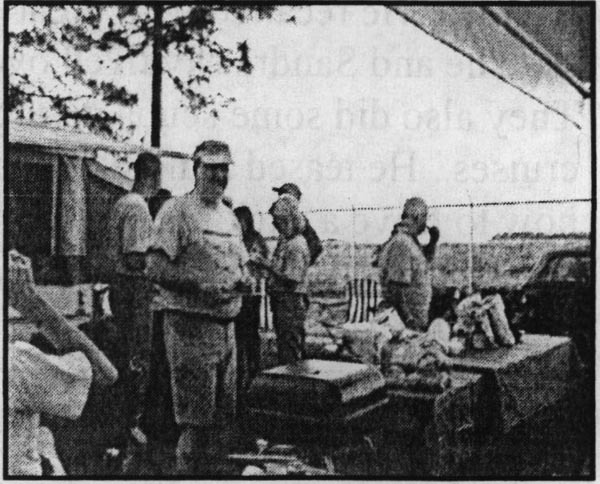 - The Parts Mart was moved from the building located near the campgrounds to a large tent beyond the ultralight area. Fortunately, they did have trams to the new location because it w ould have been a long liike. It appeared tliat the volume of items being sold w as comparable to previous years. The former Parts Mart building was used for additional vendor booths. I would describe the vendors there with one word - Lonely. I just don't think they got the traffic that the other booths had inside the grounds. - The dark blue Sea Dart w as moved from grassy area next to building A to a new location near the museum entrance. Gone was the O'Doul's sample bar from that area. too. In its place, the Air Margaritaville bar sprang up. There were a couple of tent-shaded areas with live bands play ing Jimmy Buffet-esque songs, many Adirondack chairs painted in bright Florida colors and plenty of folks hoisting light green colored drinks from wide brimmed glasses. - One vendor, the Great Atlantic Airplane Company, was actually selling everytiling they brought to the show at a 20% discount. When was the last time you saw that? Unfortunately they w ere selling everything at a discount because they w ere going out of business. We'll be sorry to see them go. - One really big change was the question on everyone's lips "Where in the world is Rod Machado?" He is always a regular at these big events. His booth and staff were there but he was not. They said he had a conflict. Apparently so many people were asking about him that they actually kept a running tally of the number of inquiries. I guess we'll have to wait for the eleven o'clock news to know the real story. We always enjoy Rod's unique style of aviation education between sidesplitting accounts of life as a flight instructor. - Imagine a Super Cub on floats with a 200 hp turbine engine! Yes. they had one there as shown in the picture. Apparently it flew so fast that it shredded the fabric right off the plane! 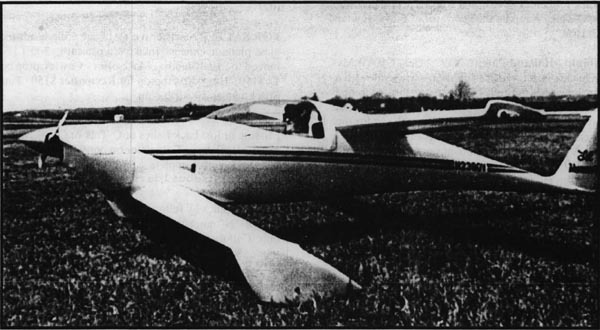 You can read more about this VERY compact beast in the April 2003 issue of Sport Aviation. The vendor claims they are dow n to about 11 gallons per hour at cruise and they hope to get even lower numbers as they complete their R&D. Heck with the Super Cub. Maa would that make a SUPER Quickie! - We were blessed with a fly-by of an F117 Stealth Fighter. Good to know they weren't all deployed to Iraq! - It looks like the Extra 400 folks need a little more R&D time to figure out a better way to rig up some air conditioning! - The nighttime aerial fireworks show was amazing to watch. If you couldn't hear those big round engines of the four T-6's flying aerobatics in the dusk sky. you would swear they had their afterburners on. Gold colored fireworks sparkled from their planes while they banked in a tight diamond formation. 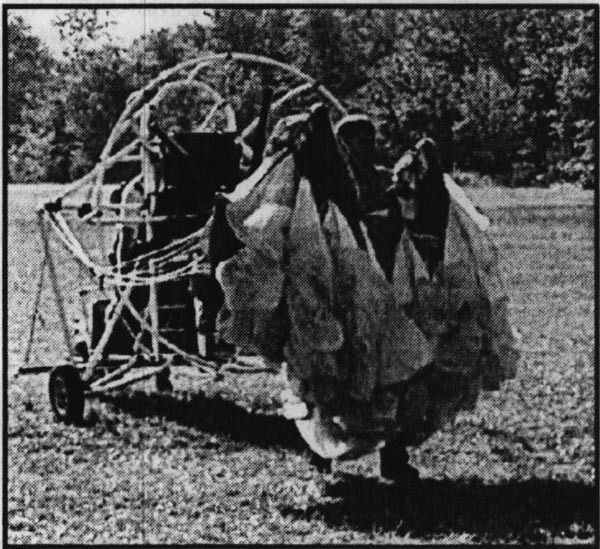 The silent sailplane was also captivating to watch as it preformed graceful loops and rolls of with firew orks from its w ingtips. There were some major Ooooh's and Aaaaah's from the crowd. - They added a very large television screen to the central part of the walkway. 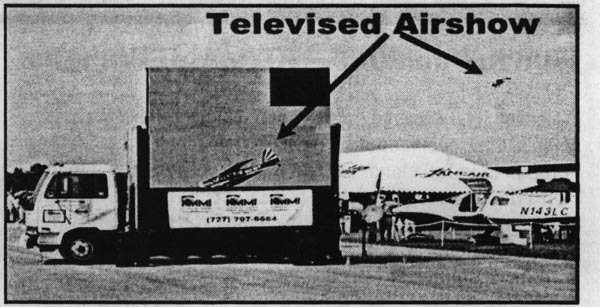 Much of the day displayed w ar coverage but during the air shows, they televised closeups of the performers. - We attended an evening video and discussion presentation of the book America from 500 Feet written by nature photographer. Bill Fortney. 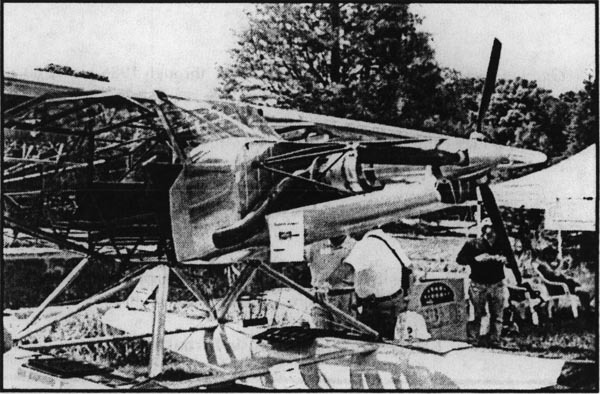 Bill and his son pulled an ultralight in a trailer more than 70.000 miles to all four corners of the continental USA. They were able to capture 150 breathtaking images of our great nation from a perspective only we aviators know. This effort took 14 months. We were quite moved by Bill's story and highly recommend his book. - Early one morning over forty hot air balloons launched to participate in a "Hare and Hound" race. 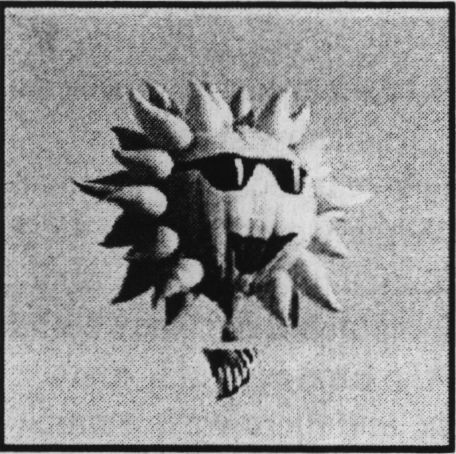 The Hare was a uniquely shaped sun balloon. 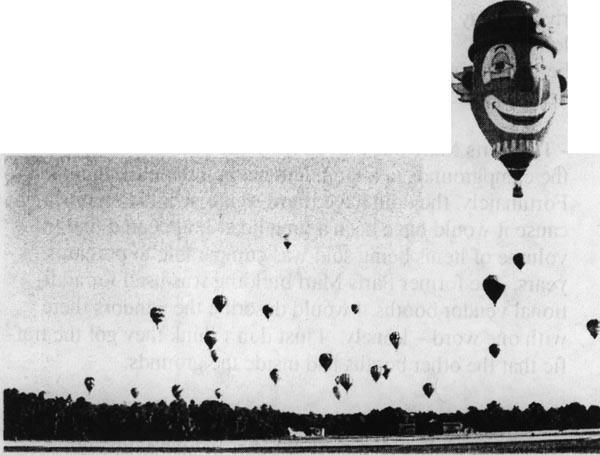 To give you some perspective, the smallest rays found on the face of the balloon were 25 feet from base to tip. It was fun to w atch the various strategies used to catch the Hare. Some pilots would go really high and others went very low. - The countdown to Kitty Hawk was in full swing. There was a full-scale replica of the Wright flyer. There were also three Wright flight simulators. 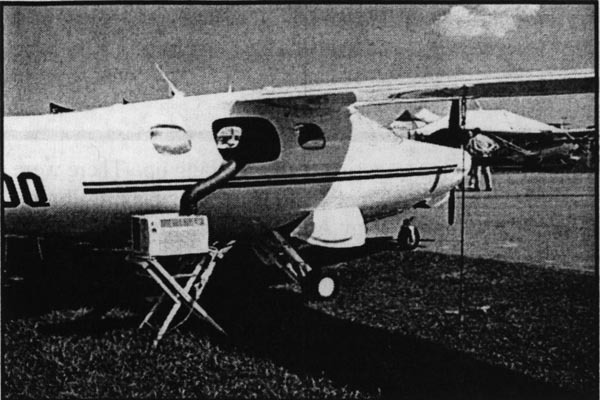 A pilot would lie down on a platform and operate the Wright controls in conjunction with excellent graphics by Microsoft Flight Simulator. I found the plane was not very stable and put a dent in the plane on my virtual flight. I bet you will have a chance to see this exhibit at Oshkosh tliis year. It is worth the wait in line to just to see if you can keep the wings level. - We really felt underdressed in our shorts and T-sliirts when we visited the Ultralight area and saw this lad with his petticoat showing. 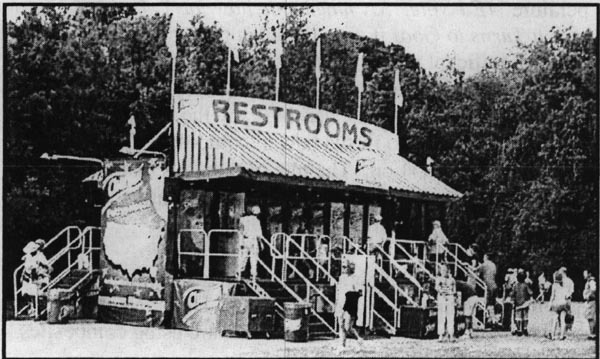 - One unique and pleasant experience was the Channin "Pottypalousa" truck. This eighteen-wheeler was also an eighteen-holer! Yes. Charmin had 18 of the nicest attended bathrooms at the airport. Each potpourri scented stall had a small sink, mirror. Cliannin bear wallpaper and a liquid crystal TV monitor displaying Cliannin ads. They w ere testing a new Aloe TP and you could rate its effectiveness after your visit. If I say Char-min one more time you will probably think they paid me for tliis ad space, but they didn't. I just liked it that much. We had a fair turnout at the QBA forum this year and but only one Q on the field. Mike Dwyer' Q2(X). There were a couple of new faces in the crow d. Jim Masai led the discussions with liis traditional wit and glares for those w ho ventured beyond the plans. Every Q builder or wantabe builder had a chance to share new s about their project with the group. For example. Roy Shannon reported the Quickie he started in 1997 is now at the airport and he has taxi tested up to about 50mph with good control. He is tracking down a vibration at 1700 and 2300 rpm's as well as high temps under tlie cowling. Kurt Van Dyke shared a tip with the group about mixing micro. Once he has detennined the optimal ratios of epoxy to micro balloons, he is careful to use the exact same measurements for each batch. Consistency helps to avoid hard spots when sanding. Kurt has also found that by using a Zip-Loc Baggie, the materials can be thoroughly mixed and the tiny micro balloons can be contained. Jerry Marstall recommended applying for the "special" certificate when certifying our planes. This designation allows you make major changes to your airframe with only a logbook entry and a 5-hour test period. You can even request this change to your existing certification but you may be required to have your plane inspected again. Jerry also recommended installing a stop in the reflexor system to prevent the ailerons from being reflexed below the neutral point. He found out first liand how a reflexed wing can overpower a canard. He also strongly suggested flying with someone in a Q before your first test flight to produce a vivid picture in your mind of the landing sequence. We had a very good turnout at the Hot Dog Roast this year. "Smokey" sausages w ere added to the menu and they seemed to be a big liit. Susie and I want to especially thank Jerry and Nancy Marstall for their help in setting up for the event. There were some pretty high level Q discussions that night. 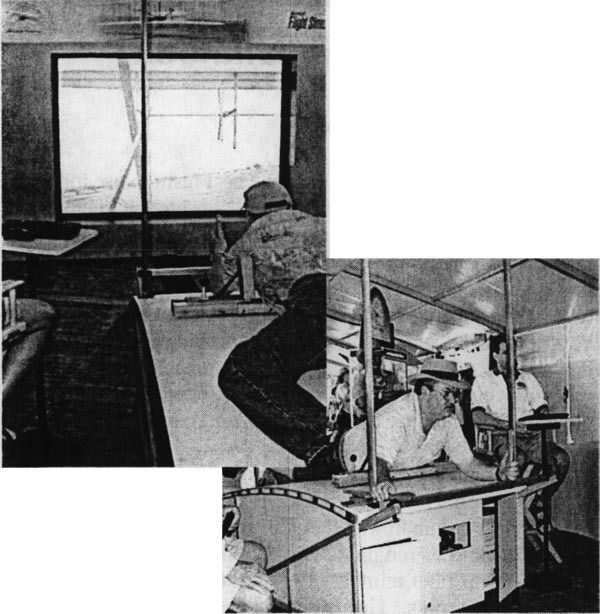 One notable item w as the photos of a Quickie trailer designed by Roy Shannon. He claims he can get his plane on the trailer and disassembled or off the trailer and assembled in only fifteen minutes by liimself! Roy promised to share his design with the QBA in an upcoming article. It looks very interesting. WANTED: New ideas and tips that could be included in Q-Talk to help other members benefit from what you have learned. Please send in your articles today! Howard Schuckler's Revmaster powered Q2 lias blue stripping down the sides of the fuselage and is dubbed "Lil Hummer'" 011 the tail. Howard is located in North East. MD. You can order a printed copy of Q-talk #98 by using the Q-talk Back Issue Order Page.